Ahmed Dogan, leader of Bulgaria’s Movement for Rights and Freedoms (MRF) party, was assaulted on January 19 as he was delivering a speech to delegates at a party conference at the National Palace of Culture (NDK) in Sofia. The assailant held a gun to Dogan’s head but the gun appeared to be stuck and was unable to take a shot. Dogan appeared to knock his assailant’s hand away before the two men fell to the ground. The assailant was subdued by security personnel and party delegates – footage by Bulgarian TV station showed that the man was attacked repeatedly by delegates and he appeared bloody when taken outside NDK to a nearby police station. The Interior Ministry said in a statement that the 25-year-old assailant was from Bourgas, with two prior convictions for causing bodily harm in 2006 and drug possession in 2010. Interior Minister Tsvetan Tsvetanov, speaking to reporters outside NDK, later identified him as Oktai Enimehmedov, a Bulgarian national and ethnic Turk. An investigation was underway, Tsvetanov said, with Sofia city prosecutor Nikolai Kokinov on site. Security also found a knife on the assailant. Reports said that unlike previous occasions, there were no metal detectors in place outside the hall where the party congress was held – detectors were only put in place after the attack, but the party conference is yet to resume. The Interior Ministry said that police officers provided security outside the building, but security in the hall itself and immediately outside was taken over by the National Protection Service (the government agency that provides security for all high-ranking officials in Bulgaria). The assailant appeared to have an accreditation badge for the event and managed to go up the podium without being stopped. Tsvetanov said that the badge was from a previous MRF event and police was attempting to ascertain whether he was, possibly, a party member. 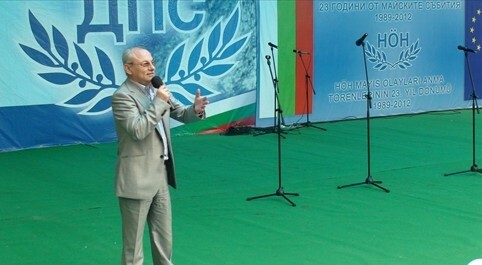 Dogan, who was jailed during the communist era for his resistance to the “revival process” (when the regime forcefully changed the names of ethnic Turks to sound more Bulgarian, deporting hundreds of thousands of people to Turkey), was one of the founders of MRF and has been its leader since 1989. He was later revealed to have been a collaborator of communist-era State Security). He has often played the part of a kingmaker in Bulgarian politics, especially in the past decade, his party’s support instrumental to keep in power the cabinets of prime ministers Simeon Saxe-Coburg (2001/05) and Sergei Stanishev (2005/09). On the eve of the party conference, reports in Bulgarian media said that Dogan planned to step down in favour of long-standing deputy Lyutfi Mestan. The Sofia Globe has established that the prepared text of Dogan’s speech included – towards the end – the announcement that he intended not to continue as leader of the party. Tim Harris, a member of a Liberal International delegation and a South African MP, who was in the hall along with other Liberal International members from various countries, said that the assailant had pulled the trigger twice. Within moments, there was “pandemonium” in the hall, Harris said. Some people fled the hall, apparently fearing a wider attack, while others rushed into the venue. “I’ve never seen anything like this,” he said.